Some Americans are having a change of heart about mixing religion and politics. A new survey finds a narrow majority of the public saying that churches and other houses of worship should keep out of political matters and not express their views on day-to-day social and political matters. For a decade, majorities of Americans had voiced support for religious institutions speaking out on such issues. As a result, conservatives' views on this issue are much more in line with the views of moderates and liberals than was previously the case. Similarly, the sharp divisions between Republicans and Democrats that previously existed on this issue have disappeared. [FONT=times new roman,times]There is a partisan gap as well. Republicans - by an 11-to-1 margin - favor capitalism. Democrats are much more closely divided: Just 39% say capitalism is better while 30% prefer socialism. As for those not affiliated with either major political party, 48% say capitalism is best, and 21% opt for socialism. 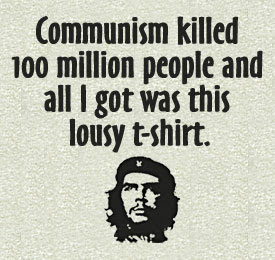 Obviously, leftist dominance in academia and education are having exactly the effect that was foretold many years ago; younger people have been so indoctrinated to believe that capitalism is evil that they have no clue that all those material possessions they take such delight in using - TV, computer, internet, CD's, - would not be available to them in most socialist countries. There is also the callowness of youth at work with these attitudes as once these youngsters grow up and start to raise a family, all of a sudden they want lower taxes and the opportunities only afforded those who live in capitalistic societies. I sure hope the same thing happens to this crop of young people. And how about those eye popping numbers for Democrats? Just 39% believe in capitalism? Kind of makes our present situation a little more understandable, doesn't it. Enacted in 1975, the initially modest EIC has been expanded by tax legislation on a number of occasions, including the more widely-publicized Reagan EIC expansion of 1986. Today, the EITC is one of the largest anti-poverty tools in the United States (despite the fact that most income measures, including the poverty rate, do not account for the credit), and enjoys broad bipartisan support. The government of Alaska is almost all-powerful, much of the State has little or no local government. Only the larger cities and towns have local government; the State does everything, pays for all the schools, provides much of the health care, paves and plows the roads, where there are roads, builds and maintains the airports throughout the state, operates a huge ferry system which it promotes for tourist dollars, and pays any state resident's tuition at any college they wish to attend anywhere. Until recently the State even operated a major dairy. But it's instructive to bear in mind, as conservative Republicans laud her record as governor, that much of Alaska's social welfare is based on what amounts to a socialist principle of taxing big corporations for their use of publicly owned resources and returning a portion of those profits back to regular working people trying to pay their heating bills. Palin may run a quasi-socialist state government, but only because it's convenient in Alaska. No such easy solutions to budget shortfalls and rising energy prices will come in Washington DC, where the absence of an economic Everlasting Gobstopper like the Alaskan oil fields requires actual choices with actual political consequences, and where ideologies count in policy making. When the Alaskan state government needs more money, legislators don't have to resort to jacking up taxes on working Alaskans, or scrapping social programs, or turning to 'market-based solutions.' They can just raise taxes on the profits of Big Oil, as Sarah Palin did last year (not as bold a move as one might assume, given that record profit-making oil companies in Alaska had just been exposed for bribing legislators) in an effort to attain for the Alaskan people "an equitable share for our resources," and like President Hugo Chavez did in his country a few months ago for much the same reason. In fact, just last week, Palin cut checks of $1,200 to every Alaska resident to offset the burden of rising fuel prices, paid for by taxes on the oil industry. That beats the hell out of McCain's 'gas tax holiday' for making a real difference in the pocketbooks of working Alaskans. No wonder she's so popular. "Capitalism" is Karl Marx's coined term for the Free Enterprise or Free Market System so that it can be explained in ugly demonizing terms. It's the perverted loony left's way of "morally leveling the playing field." Calling the free market "capitalism" is like Ted Kennedy calling himself "Cappaquiddick Boy". Any deviation from the Creator's righteous path and plan for our lives is an abomination -- and patently UN-AMERICAN. PROOF THAT WE HAVE DONE A HORRIBLE JOB OF RAISING AN ENTIRE GENERATION. WE ARE GOING TO BE IN SAD SHAPE IN 20 YEARS WHEN THESE 30 YEAR OLDS ARE RUNNING THE COUNTRY AND BUSINESSES....OF COURSE IF THEY ACTUALLY HAVE SOME MONEY THEY MAY CHANGE THEIR MIND. <HR style="COLOR: #a93c3c; BACKGROUND-COLOR: #a93c3c" SIZE=1><!-- / icon and title --><!-- message -->another reminder that socialism does not work and leds to shortages. It is also the latest issue to divide the Latin American country where Chavez has nationalized a wide swathe of the economy, he says to reverse years of exploitation of the poor. Chavez supporters are grateful for a network of cheap state-run supermarkets and they say the raids will slow massive inflation. Critics accuse him of steering the country toward a communist dictatorship and say he is destroying the private sector. They point to 80,000 tons of rotting food found in warehouses belonging to the government as evidence the state is a poor and corrupt administrator. Jose Guzman, an assistant manager at a store raided in Catia, watched with resignation as government agents pored over the company's accounts and computers after the food ministry official and the television cameras left. "The government is pushing this type of establishment toward bankruptcy," said Guzman, who linked the raid to the rotten food scandal. "Somehow they have to replace all the food that was lost, and this is the most expeditious way." Much of the wasted food, including powdered milk and meat, was found last month in the buildup to legislative elections in September. The scandal is humiliating for Chavez, who accuses wealthy elites of fueling inflation and causing shortages of products such as meat, sugar and milk by hoarding food. "They are not going to stop us in the plan, which is to give the people what is their right," Chavez said Friday during the inauguration of a supermarket chain the government bought this year from French retailer Casino. Food prices are up 41 percent in the last 12 months during a deep recession, government figures show, despite the government's growing network of state-run supermarkets that sell at discounts of up to 40 percent and are popular with his poor supporters. South America's top oil exporter, Venezuela imports about 70 percent of its food and analysts say the economic hardships could give the opposition a boost at the ballot box?although most expect Chavez to retain a reduced parliamentary majority. Fighting back, Chavez says he is in an economic war against the "parasitic bourgeoisie" that tries to convince Venezuelans that socialism does not work by twisting facts and taking advantage of honest mistakes. "They know where we are headed, we are going to take from the Venezuela bourgeoisie the hegemony of dominance in this country," Chavez, who calls himself a Marxist, said to applause from supporters on his TV show on Sunday. He has also revived threats to take over the country's largest private food processor, miller and brewer, Polar. The president rushed to give public support to Oil Minister Rafael Ramirez, who as the boss of PDVSA is also responsible for food unit PDVAL, over the case of the rotting food. Two former PDVAL managers have been jailed in the scandal, but that has not stifled opposition charges of government incompetence. A string of expropriations and buyouts of companies during the last couple of years means the government now controls between 20 percent and 30 percent of the distribution of staple foods. "We are bringing order to prices," Trade Minister Richard Canan told Reuters during the Catia raid. "There are traders who are taking these products to the black market ... That is a crime and our government will continue to target these stores." Americans are growing increasingly suspicious of the giant corporations which largely shape the economy. When GlobeScan began tracking views in 2002, four in five Americans (80%) saw the free market as the best economic system for the future?the highest level of support among tracking countries. Support started to fall away in the following years and recovered slightly after the financial crisis in 2007/8, but has plummeted since 2009, falling 15 points in a year [emphasis added] so that fewer than three in five (59%) now see free market capitalism as the best system for the future. Americans with incomes below $20,000 were particularly likely to have lost faith in the free market over the past year, with their support dropping from 76 percent to 44 percent between 2009 and 2010. The poll suggest that American business is close to losing its social contract with average American families that has enabled it to prosper in the world. Inspired leadership will be needed to reverse this trend." Maximizing employer security is a prime company goal. The employee who can plan his economic future with reasonable certainty is an employer?s most productive asset. Compare that quaint attitude with the ruthless creed of Jack Welch, GE?s CEO from 1981 to 2001, who showed his disregard for employee loyalty when he declared, "Ideally you'd have every plant you own on a barge" By that, he meant a readiness to seek out at a moment's notice the lowest possible wages and most pliable governments (weak regulations, low taxes, hostile to unions, etc.) anywhere on the globe. U.S. multinational corporations?cut their work forces in the U.S. by 2.9 million during the 2000s while increasing employment overseas by 2.4 million, new data from the U.S. Commerce Department show. As Offshoring Continues, US Public Peeved at "Free Market"
April 22, 2011 "In These Times"